Corporate hotels in the Hawaiian Islands do something really well…landscaping. Immaculate properties of flowering tropical plants and indoor/outdoor spaces call to you with their peaceful beauty. But when it is time for dinner it is time to get out of the resort. Despite Hawaii’s history of plantations…sugar, pineapple, beef…today nearly everything ships in from the mainland. The result is a high-priced, predictable menu based on frozen food (even the fish). On each island a handful of micro- farms and independent fisherman supply the type of creative, fresh kitchens we want to eat at and I have learned how to find them. Head for a mall. We pop over to Kauai for a long weekend at a gorgeous property of creamy-colored sand and drinks with umbrellas in them. 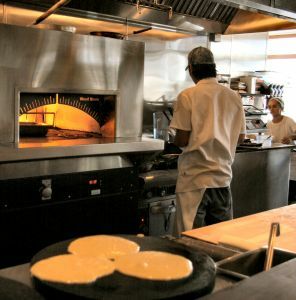 With our beach-side cocktail we order “grilled flat bread with white bean hummus and crudités”. It could be interesting and tasty, but isn’t. The hotel concierge gives a blank stare when I ask about nearby restaurants offering fresh fish and local produce. She suggests we stay at the resort. She can tell me, however, that there is a mall of small shops nearby. And it is here, just outside the resort gates, we spot The Feral Pig Pub and Diner. This is just the kind of mall I look for….a clutch of two- storied wooden buildings of Hawaiian theme stores for the visitors and boutiques and necessity shops for the locals. By the front door of The Feral Pig sits a small sandwich board listing close-by produce farmers, meat providers and a baker. The decor is minimal but the menu enticing. Dinner is a tough choice between smoked, roasted or slow braised cuts of pork, well executed and accented by unique produce. 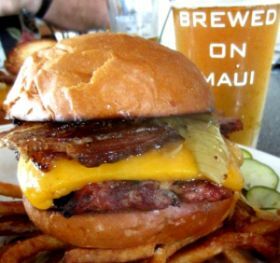 For lunch on another day we return for the feral burger: half ground beef and half ground smoked pork shoulder, locally cured bacon, caramelized Maui onions, cheddar cheese, with a spicy aioli on a bakery bun. And a Hawaiian microbrew. The Feral Pig takes its name from a local delicacy. Of the four major islands, Kauai is the oldest at five million years. That’s a lot of time for volcanic peaks to erode into deep gorges and dramatically furrowed sea cliffs. Pigs and goats, escaped descendants of livestock that arrived in the nineteenth century, inhabit inaccessible wild areas. These feral pigs and wild goats are highly celebrated by hunters and chefs. The next day we need a tasty breakfast before a hike above the magnificent Kalalau Valley. We head out for the Kukui’ula Shopping Mall in Koloa. Old Koloa Town is the home of Hawaii’s first active sugar mill, the birthplace of the state’s strongest industry for more than a century. Koloa lies just a few miles south of mountain peaks that gather some of the highest rain fall on earth. Yet these flat lands extending toward the sea are sunny and semi-arid. Produce is particularly hard to come by and expensive on the Islands. California sends hearty lettuces (iceburg, romaine), carrots, cucumbers, celery, potatoes but not delicate, perishable produce. I stop by the local Kauai Food Bank in Lihue to see what is available. Plenty of packaged and canned goods, mostly products donated with expired sell dates. I ask about produce and a volunteer points to one flat of wilting lettuce in a cooler. “We don’t really get anything fresh” she tells me. Local fish isn’t easy to find either. Most is commercially taken and exported, and one evening we set out for a recommended restaurant in Kapa’a. From the 1300s, Kauai’s kings thrived amid coconut groves and fish farming ponds around Kapa’a on the eastern flank of Kauai. During the nineteenth century Hawaiians lost control of Kauai and the coconut groves were expanded for export. Under the gentle sway of 100 foot tall coconut palms, the remnants of the once flourishing grove, we search Kauai Village Shopping Center for the Pacific Island Bistro. We find the bistro tucked between a Subway Sandwich shop and a Starbucks. It is early and the place is already full of diners enjoying dishes like Kailua pork lettuce wraps, opakapaka fish in red Thai curry and Pacific seafood chowder. I ask Richard Liang, the owner, which fish are fresh today and he gives me a straight answer. “None of them. All frozen. When the boats do not go out, there is no fresh fish.” Liang was the manager of a restaurant that perennially was voted the best Chinese on Kauai so we figure his signature Peking Duck should be good and it is. Mid way through our meal a shaggy-haired young man in flip flops rushes in, headed for the kitchen with two shining Mahi Mahi in a bus tub. Our guess is his boat just got in and he is delivering as quickly as he can, and later tonight there will be very fresh fish on the menu.